Understand strengths and gaps of your board based on individual and confidential board member and stakeholder feedback. 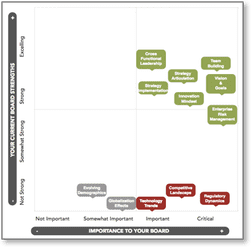 Shows your organization’s most valued board competencies. Identifies strengths and gaps based on board member input. Tailored recommendations to help close gaps.